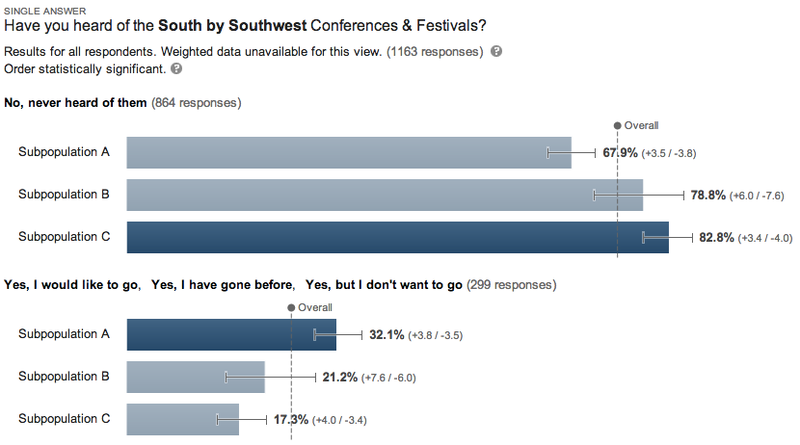 This year’s SXSW Interactive proved the biggest yet with 30,621 paying attendees. That was 24.6 percent larger than 2012. The festival had predicted only 5 percent to 8 percent growth but had another of its typical surges of walk-up registration. Last year’s growth rate was a similarly high 27 percent. To put that 30,000 number in perspective: The Consumer Electronics Show had an attendance of over 150,000 this year. PyCon 2013 sold out all 2500 tickets. So don't worry! It's still esoteric. The chances are low that you've even heard of SxSW.